The focus will be on directing the implementation and fulfillment of conditions, dossiers, procedures, and processes to strive to establish Kinh Mon provincial town within this year. Mr. Nguyen Manh Hien, Member of the Party Central Committee, Secretary of the Hai Duong Provincial Party Committee (PPC), Chairman of the Provincial People's Council, on March 20 morning presided over a regular late March meeting of the PPC's Standing Board. The PPC's Standing Board heard a report of the Party Civil Affairs Board of the Provincial People's Committee on a project to establish Kinh Mon provincial town and its wards. The PPC's Organization Board reported on a plan to realize the Politburo's Conclusion 38-KL/TW dated November 13, 2018 on improving the leadership and fighting capacity of grassroots Party organizations and the quality of officials and Party members. In his speech to conclude the meeting, PPC Secretary Nguyen Manh Hien affirmed that the PPC's Standing Board would focus on directing the implementation and fulfillment of conditions, dossiers, procedures, and processes to strive to establish Kinh Mon provincial town within this year. He basically agreed to the proposal of the Party Civil Affairs Board of the Provincial People's Committee to set up An Luu ward on the basis of Kinh Mon town, Pham Son ward on the basis of merging Pham Menh and Thai Son communes, and Quang Thanh commune on the basis of merging Phuc Thanh and Quang Trung communes. However, functional agencies and Kinh Mon district authorities should consider the establishment of Quang Thanh commune or ward to suit the local development in the time to come. Kinh Mon District Party and People's Committees should intensify propaganda for locals to grasp information, raise their awareness and responsibility, and consent to the district authorities' guidelines, especially in the communes to be merged. 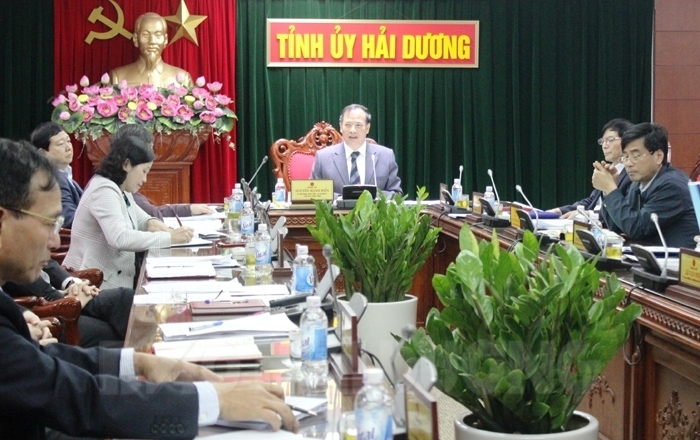 The PPC Secretary assigned specialized bodies of the Provincial People's Committee and boards of the Provincial People's Council to coordinate with Kinh Mon district authorities to continue reviewing and perfecting the project to establish Kinh Mon provincial town and its wards for submission to the Provincial People's Council at a meeting this May and to Central bodies. Regarding the draft plan to realize Conclusion 38-KL/TW, PPC Secretary Nguyen Manh Hien assigned the PPC's Organization Board to absorb suggestions of members of the PPC's Standing Board for amendment and perfection. The PPC's Organization Board should update itself on directions of Central bodies, the PPC's Standing Board, and the Provincial Party Executive Committee to heighten norms in the plan compared to those assigned by Central and provincial authorities and continue to review and supplement the plan with the innovation of the mode of the Party's leadership, especially the addition of appropriate regulations and regimes on activities of grassroots Party cells and committees to improve the capability of grassroots Party organizations. He noted that the completion of the contents and realization of the plan must ensure the continuance of adherence to and covering of the directions in and contents of the 10th Party Central Committee's Resolution 22-NQ/TW on improving the leadership and fighting power of grassroots Party organizations and the quality of officials and Party members.